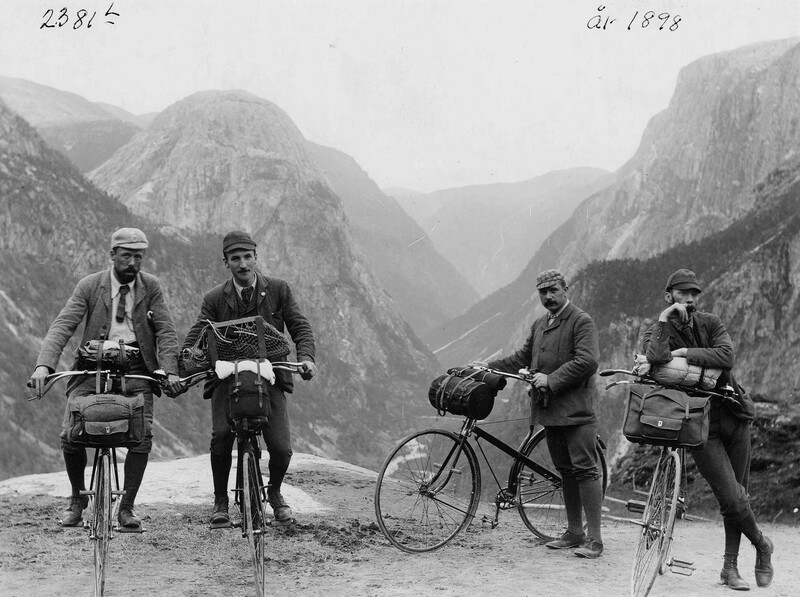 People have been touring with front loads since the 1800s, but front racks really only became popular with the advent of bicycle panniers in the middle of the 20th century. Nowadays, we have many different front rack styles that suit the different types of gear and bikes we employ for our tours. Let’s take a closer look at the different styles of front racks for touring bikes. The Tubus Tara lowrider rack on my Co-Motion touring tandem. Lowrider racks are common on touring bikes as they keep your pannier weight as low as possible to the ground. 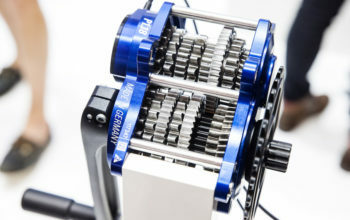 This allows heavily-laden touring bikes to feel as stable as possible at both low and high speeds. 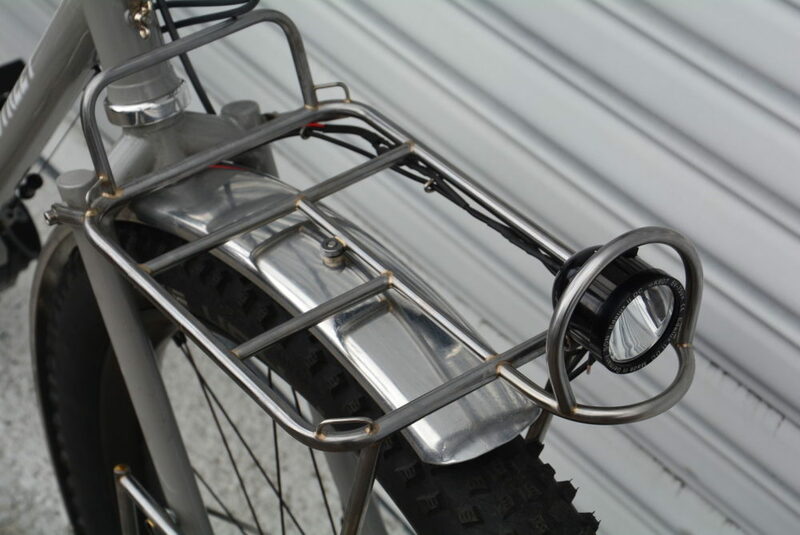 Most lowrider racks require both a mid-mount on the fork and lower eyelets at the dropout, however, I’ll cover alternative mounting methods below. 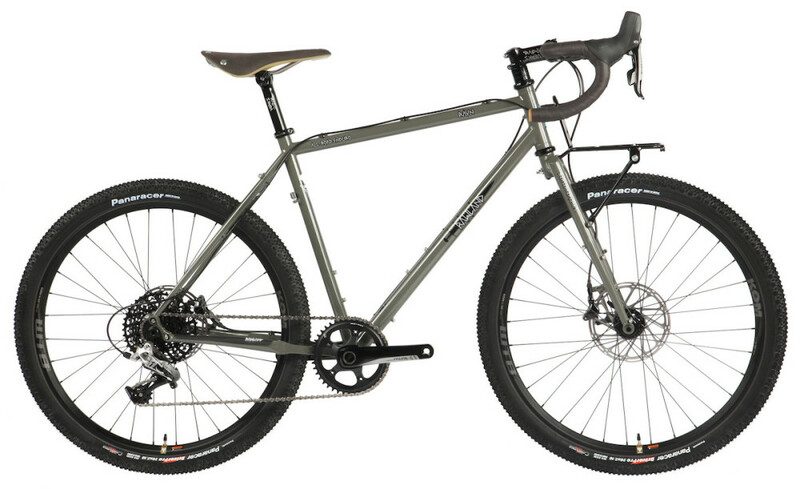 Popular models: Blackburn Outpost, Nitto MT-Campee, Surly Front Rack, Tubus Duo and Tara. Porteur racks are designed to stabilise large front loads above the wheel. 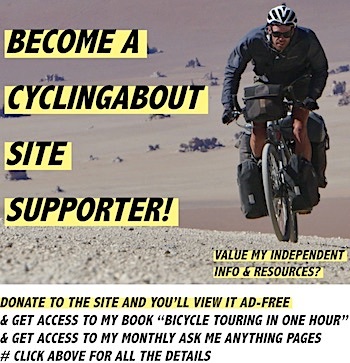 Their history stems from the 1950s in France where the ‘porteurs’ would distribute large quantities of newspapers from the front of their bikes. Nowadays, this open rack design tends to be better at carrying boxes and other unusually shaped objects due to the large rack platform. 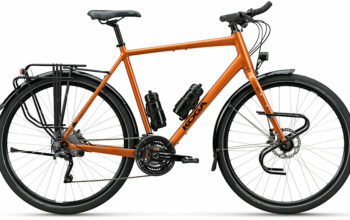 Popular models: CETMA 5-Rail, Soma Porteur, Surly 24-Pack, Velo Orange Porteur. A basket rack is essentially a porteur rack with a cage around the outside. They key advantage of this design is to reduce the need to strap things down. You can create your own basket rack using a porteur rack in combination with a wire basket. ‘Wald’ is a renowned wire basket brand. Popular models: Blackburn Local Basket, Gamoh FR-1, Minoura King Carrier, Soma Porteur, Velo Orange Porteur. 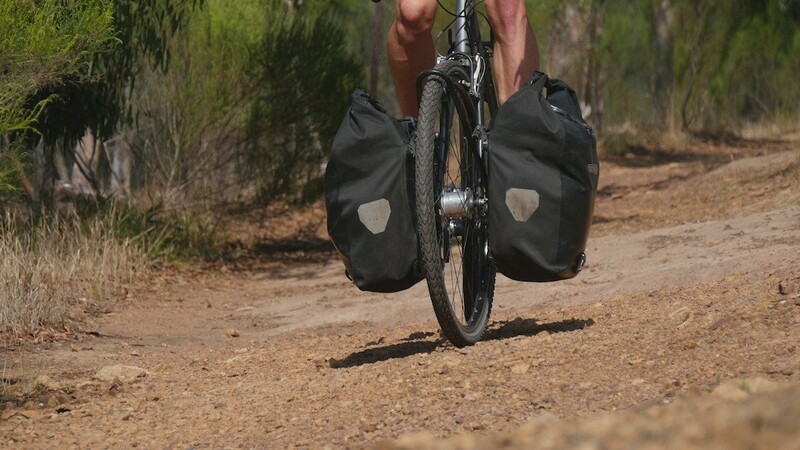 The Faiv Hoogar rack allows your panniers to become ‘sprung’ weight. Suspension racks are designed to connect to a front suspension fork. There are two different types of suspension rack however; one mounts the rack from above the suspension (like the Faiv Hoogar), the other mounts it below (like the Old Man Mountain). In order to get the most out of the suspension of your bike, it’s best to use a ‘sprung’ rack like the Faiv Hoogar. 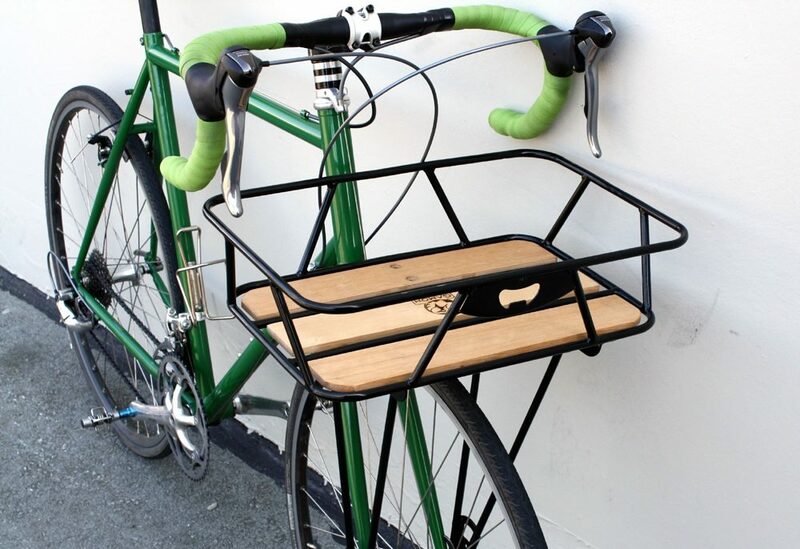 These minimal racks are used to support the weight of small randonneur bags. 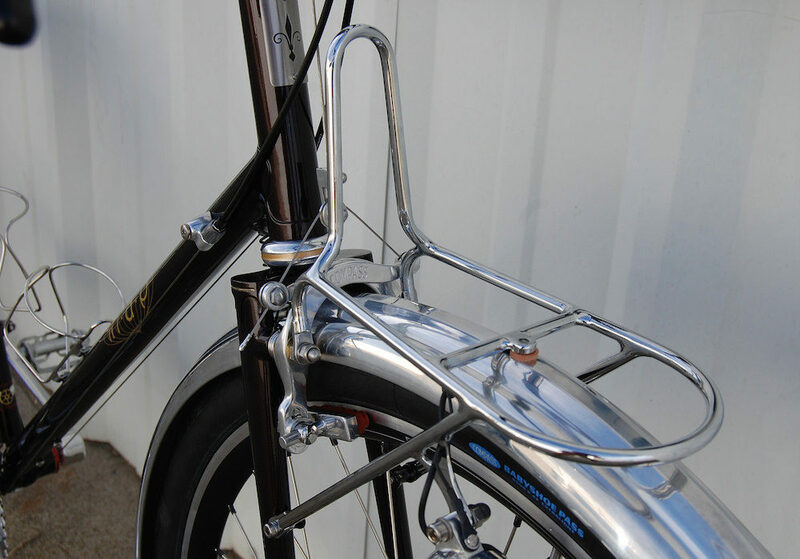 The lower struts connect to rim brake mounts or lower fork eyelets, and the upper struts generally connect to the fork crown hole. Popular models: Nitto Campee 32, Soma Champs Elysees, Surly 8-Pack, Velo Orange Constructeur, Velo Orange Randonneur. 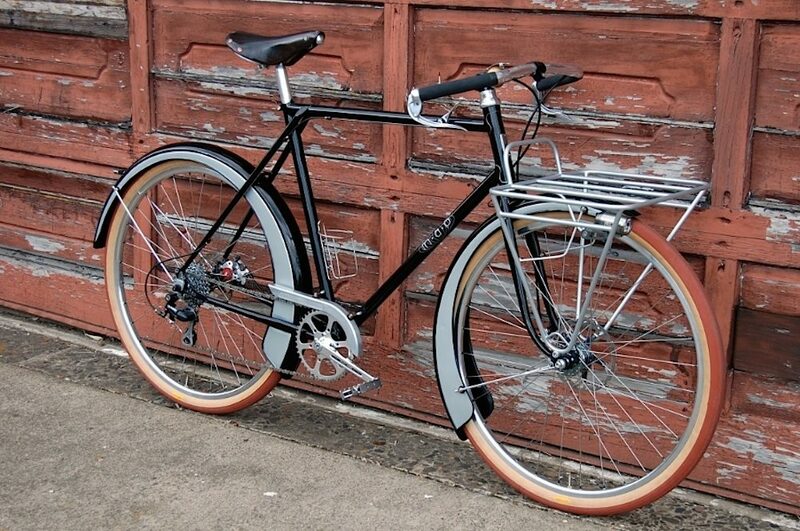 A decaleur is a special mount that is designed to stabilise the load of a front randonneur bag. 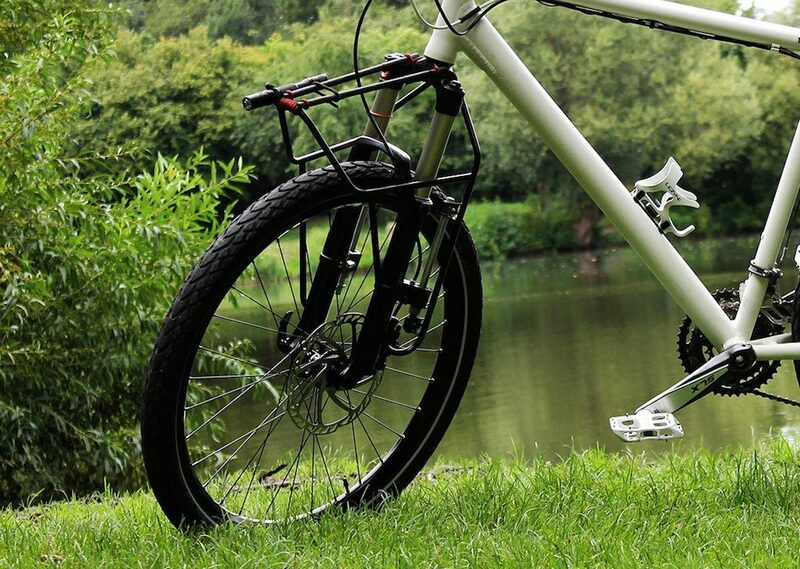 They can mount directly from a front rack, your stem or steerer tube and make bag mounting very straightforward. 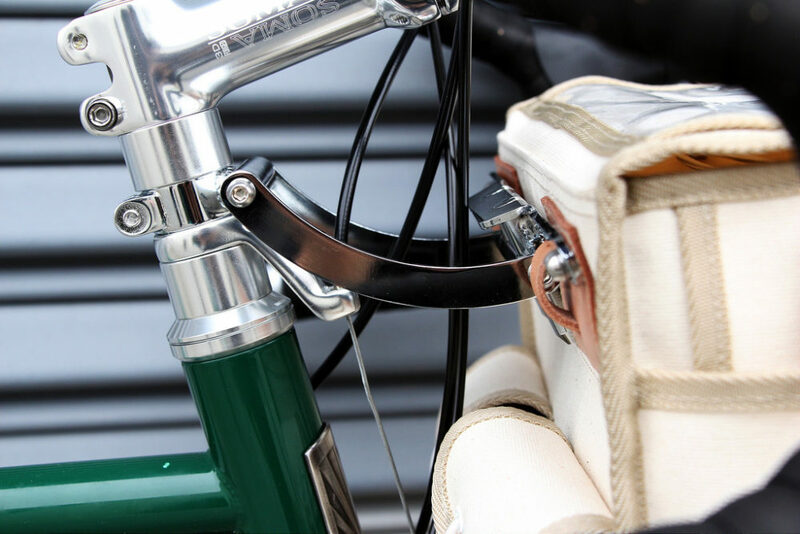 A metal bracket generally needs to be custom fitted to the randonneur bag to achieve the perfect fit. Decaleur brackets for steerer tubes are available in both 1″ and 1 1/8″ diameters. Where Is The Best Location To Carry A Front Load? In a handling sense, it’s best to pack your load as low as possible on a bike. 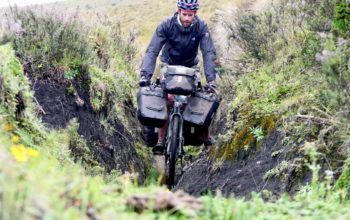 That’s one of the reasons why touring bikes often use front panniers on lowrider racks. By keeping your weight low, you reduce the bike’s centre of gravity and therefore achieve better manoeuvrability. That said, light loads of less than 10kg (22lbs) are generally fine above the height of the wheels on both randonneur or porteur racks. I’ve completed testing between front and rear pannier loading found HERE. 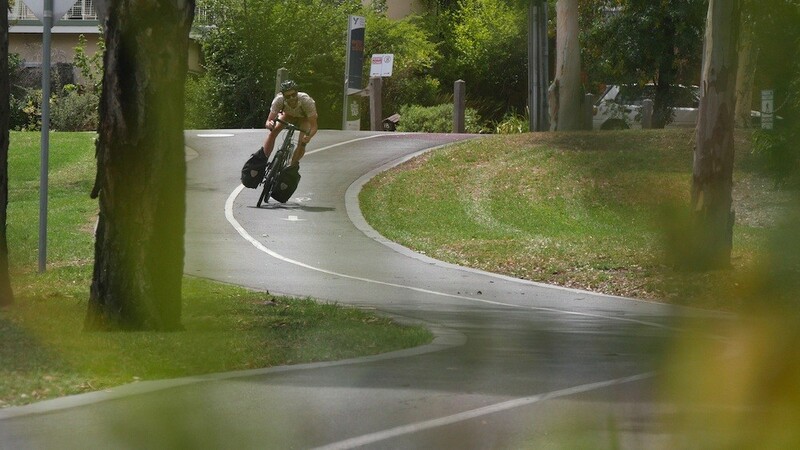 Testing the handling effects of front panniers. Front racks can be made out of steel, stainless steel, titanium or aluminium. I’d like to stress that all of these materials can be employed to construct a strong rack, but the most durable tend to be made out of steel or stainless steel. 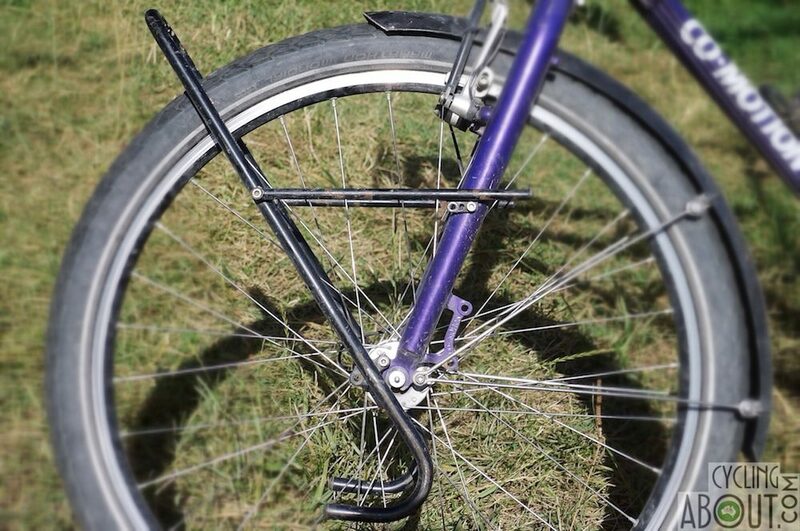 Steel racks are the most widely used by round-the-world cyclists – I’ve had my Tubus Tara for a decade now! Aluminium racks tend to have a higher rate of failure, so if you’re going aluminium, do a bit of research on the racks durability first. A Page Street Cycles custom stainless steel rack. You may have heard of ‘low trail’ bikes. These bikes are designed with faster steering speeds in order to offset the slowing effect of a front load. I’ve had a good play with low trail steering and have determined that it can be a good thing for sub-10kg loads and road handlebars (due to the reduced steering leverage when compared to a flat handlebar). With a heavy load, I’ve found a bikes steering speed has little influence over the increased steering effort. The Rawland Ravn’s fast steering is designed to offset the slowing nature of a front load. What If Your Bike Doesn’t Have Rack Eyelets? L-R: Axiom Journey Disc, Tubus mid-mounting kit, Thule Pack ‘n Pedal QR rack. Axiom Journey Disc Lowrider – The Journey rack mounts at your wheel skewer and fork leg to create a lowrider system that suits most forks. Tubus Mounting Kit – If your fork doesn’t come with mid-mounts, Tubus make a nice conversion bracket that will suit most lowrider racks. 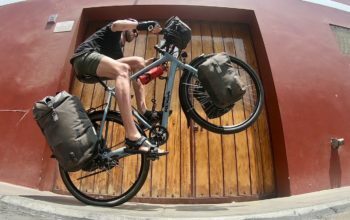 Thule Pack ‘n Pedal – The Pack ‘n Pedal uses webbing ratchet straps to fit any shape. They also sell side frames in order to attach your panniers. L-R: P clamps, CETMA 5 Rail porteur rack, Old Man Mountain front suspension rack. 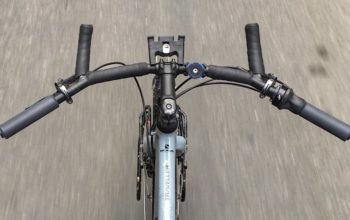 P-Clamps – Mounting a rack to a fork can be as simple as finding rubberised p-clamps from your hardwear store and mounting a front rack to your bike. CETMA 5-Rail – This porteur-style steel rack is a popular option for bicycle couriers as it’s able to handle 30kg+ (60lbs) and will fit almost any bike. Old Man Mountain – This business makes all kinds of rack solutions to suit suspension forks, fat bikes and thru axle frames. Most of their racks connect at the quick release skewer and use a p-clamp solution for the upper mounting. I’ve found that it’s no problem to fit large rear panniers on lowrider front racks with any wheel size larger than 26 inch. 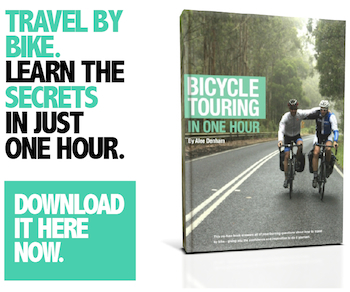 This will give you the opportunity to fill your panniers with lighter, bulkier items up front (like sleeping gear). Using large rear panniers on my front lowrider rack. While this front rack resource throws lots of options into the mix, finding the right rack style is simple: it’s all about matching your front rack to your intended use. If you’re carrying front panniers or if you have a heavy front load – it’s hard to go past lowrider racks. This rack and pannier system puts your gear weight in the most optimal location for good bike handling. Panniers are also waterproof and easy to remove from a bike. My favourite brand of front pannier rack has to be Tubus; their racks are constructed using steel, they’re lightweight and they seem to last forever. When carrying a modest load you can keep your gear above the wheel. Porteur and basket-style racks can stow awkward shaped objects as well as large 20L porteur bags (about the same size as a single rear pannier). Alternatively, randonneur racks and decaleurs do an excellent job of making your front gear accessible, although they don’t offer much in the way of storage. If you have front suspension and will be riding off-road, it’s a great idea to look into the Faiv racks. Although quite cost prohibitive, you’ll get the most out of your suspension system when your gear weight is “sprung”. The Faiv racks are far less essential for smooth road touring, so check out the Old Man Mountain or Axiom disc racks in that case.